The Bookstore Plus Hosts Author Signing Event with Kathryn Schneider on Saturday, June 1st, 2018, from 3:00-5:00 PM. Join The Bookstore Plus for an exciting book event! Kathryn will be at The Bookstore Plus to autograph copies of her book "Birding the Hudson Valley". She will be in the store to discuss and personalize the book. ABOUT THE BOOK: Although an estimated four hundred thousand Hudson Valley residents feed, observe, or photograph birds, the vast majority of New Yorkers enjoy their birdwatching activities mostly around the home. Kathryn J. Schneider’s engaging site guide provides encouragement for bird enthusiasts to expand their horizons. More than just a collection of bird-finding tips, this book explores Hudson Valley history, ecology, bird biology, and tourism. It describes sites in every county in the region, including farms, grasslands, old fields, wetlands, orchards, city parks, rocky summits, forests, rivers, lakes, and salt marshes. Designed for birders of all levels of skill and interest, this beautifully illustrated book contains explicit directions to more than eighty locations, as well as useful species accounts and hints for finding the valley’s most sought-after birds. 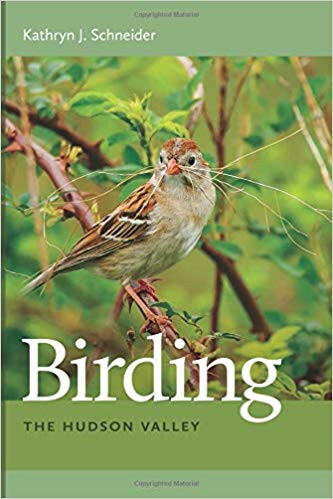 In addition to providing current birding information, Schneider explores the history, ecology, and bird biology, making this a great all-around guide for the birding enthusiasts of the region.